TMS Europe LTD, regulated by the Malta Financial Services Authority in compliance with the European Union (MiFID), is offering €20 Bonus to all its new clients upon registration for a live account and phone number verification. The clients can use this opportunity to get the hang of the offered products in the live market and earn themselves some profit. All the new clients are required to register for a live account and confirm their telephone number in their personal cabinet to receive the bonus. 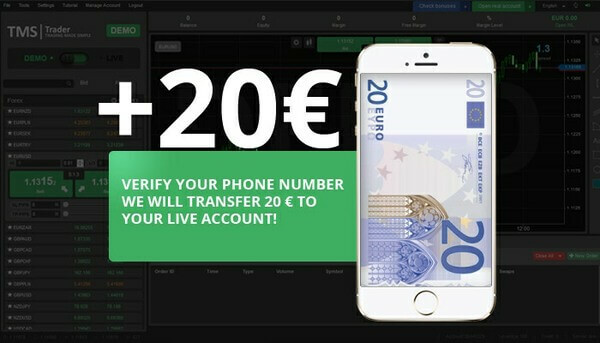 As soon as the process of verification is completed, the amount of €20 bonus will be transferred to their live accounts and available for trading. The bonus amount can be withdrawn only when the clients trade 2.5 standard lots on their live accounts no later than three months after receiving the bonus. The bonus is also subject to losses when you exhaust your deposit amount through trading; For example, if you lose €5 of your bonus and add €80 to your account, upon completion of the required lots (2.5) with the €95 in your account, you can withdraw the remaining €15 of the bonus. All you need to do is to open a demo account on www.tmseurope.com, select the €20 Phone Verification Bonus on the promotion page, and verify your phone number by receiving a confirmation SMS and entering the code after which the €20 Bonus will be transferred to your live account. Now you need to fund your live account to be able to trade in the live market. Verification of the phone number should not exceed six months after demanding the bonus. The clients can only use the TMS Trader Web Platform for this particular bonus. All the financial instruments are accepted for trading the bonus excluding Equity CFD’s, ETF’s, W20. Get TMS Europe €20 Bonus Now!